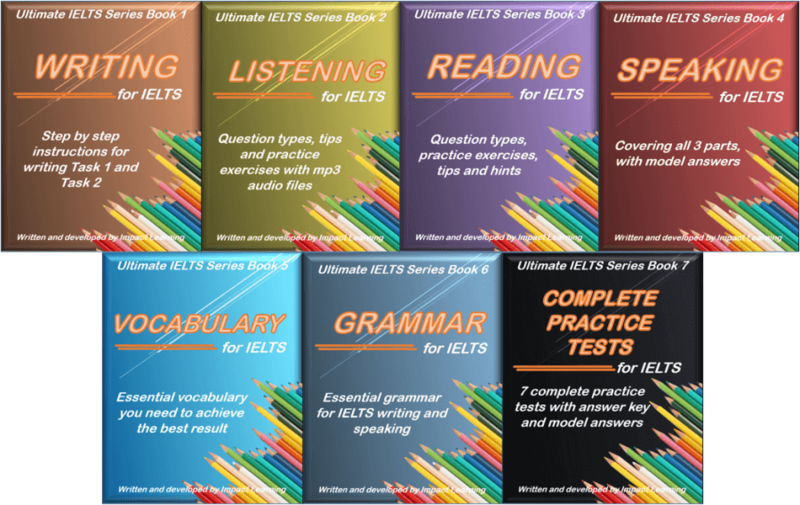 ​With downloadable audio files and over 800 pages in total, the 7 FREE IELTS eBooks are automatically included in your membership for the SPEED, EXPAND, MASTER and ACE memberships. ​The eBooks cover writing, listening, reading, speaking, vocabulary, grammar and practice tests, with exercises and a full answer key. 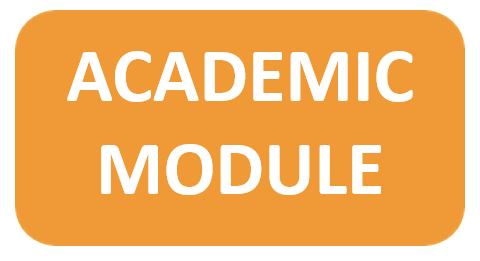 There are also downloadable audio files with listening exercises and model answers for the speaking test. ​Take a look below to see more about what is in each of the seven eBooks. 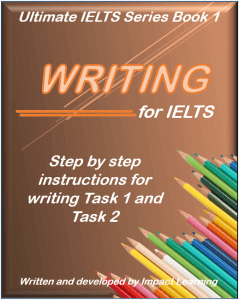 The writing book covers Task 1 and Task 2, from planning your essay and writing a good introduction to organising your paragraphs and presenting your ideas. As well as the lessons and exercises, there are over 80 Band 9 model answers, as well as sample answers ranging from Band 5.0 to Band 8.0. 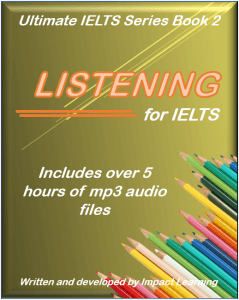 ​The listening book covers all of the question types used in the IELTS test from short answer questions and summary completion to multiple choice and matching. Get to know all of the tips and tricks for improving your result, as well as common errors like losing focus on the listening, different accents and much more. ​The reading book will show you how to improve your result with details on speed reading, skimming and scanning, recognising qualifying words and more. Avoid common IELTS pitfalls like running out of time, and learn essential skills like what to with unknown vocabulary and how to identify the main idea in a sentence. Lessons on answering every type of question in the IELTS reading test, from Headings questions and True/False/Not Given to classifying and locating information. 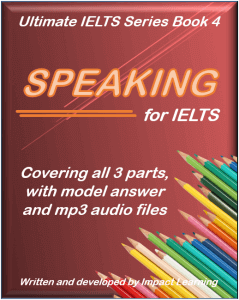 ​The speaking book will help you improve your result in all three sections of the speaking test, from speaking informally in Part 1 to presenting yourself more academically in Part 3. Study our tips and hints on how to improve your fluency and vocabulary, as well as reading model answer for a range of Part 2 topic cards. ​Knowing how to improve your vocabulary for IELTS can be difficult, but not with our Ultimate IELTS Vocabulary book! Broken into IELTS topics such as health, the environment, transport and travel, you will learn new vocabulary in an IELTS context. 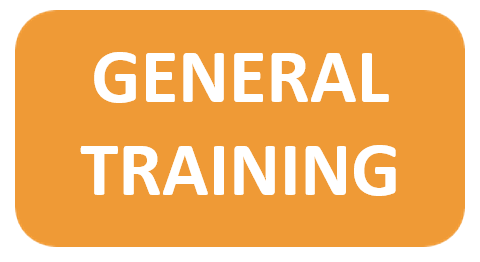 See new words in context as they are used in IELTS style sentences, and take the exercises to help you remember them. ​No matter how well you may be able to communicate, without good grammar you can’t expect a good result. 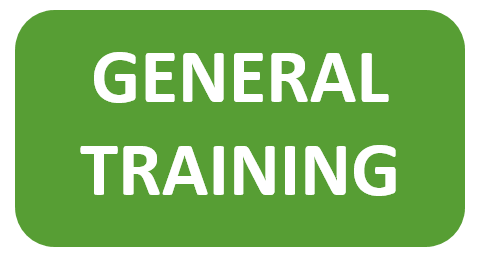 This essential grammar guide will help you master English tenses, as well as more advanced forms of grammar like relative clauses, participle clauses, the subjunctive and more. 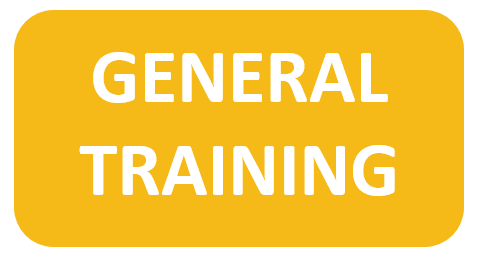 Full explanations and practice exercises included. ​Test your skills with ​3 complete practice tests (​3 complete reading tests, 3 complete writing tests, 3 complete speaking tests and 3 complete listening tests). 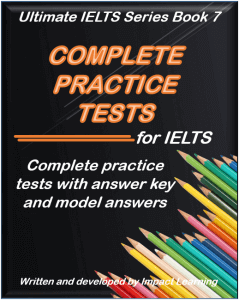 Full answer key and model answers are given, as well as a band score converter so you can see your approximate IELTS score. ​Don't delay - enrol now!